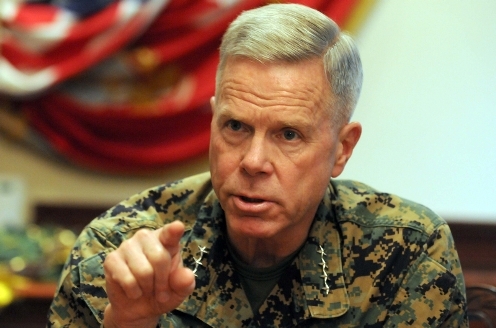 You are at:Home»General officers»Could Gen. Jim Amos step down as commandant to head NATO? The announcement yesterday that Marine Gen. John Allen will retire instead of becoming the supreme allied commander of NATO immediately raises a question: Who will head to Brussels instead? Foreign Policy reported on its E-Ring blog that names being floated for the NATO job include Marine Gen. Gen. Jim Amos, commandant of the Marine Corps. The Daily Beast had a similar report last week, before Allen’s decision to retire was announced. Could Amos really move on, though? A shift like that would be a shock in the Corps, which Amos has led since October 2010 through a time filled with difficult budget decisions, in light of the nation’s federal budget crisis. Lt. Col. Joseph Plenzler, the commandant’s spokesman, said Wednesday that they “haven’t heard anything.” Plenzler wasn’t aware of any ongoing discussions that would lead to Amos being nominated as supreme allied commander of NATO and head U.S. European Command. Already, the Corps has had one shakeup at the top within the last few months, when Gen. Joseph Dunford stepped down as assistant commandant to replace Allen as the head of the International Security Assistance Force in Afghanistan. Gen. John “Jay” Paxton, previously the commander at Marine Corps Forces Command, out of Norfolk, Va., was pinned with a fourth star and replaced Dunford as ACMC in December. The Corps also stands to lose both Allen and Gen. James Mattis, head of U.S. Central Command, from the joint realm within weeks. Mattis is expected to retire as soon as next month, reportedly thanks in part to what some have described as differences of opinions with civilians at the White House. Before Amos was selected, military and civilian observers alike widely speculated that President Obama would select either Mattis, Dunford or Allen to become the 35th commandant of the Marine Corps. The Amos choice was seen as a surprise given his background as a career aviator, rather than as an infantry officer. — The Marine Corps’ top three officers — the commandant, the assistant commandant and the three-star director of Marine Corps staff — typically comprise a “mini-MAGTF,” or Marine air ground task force. That means that if the commandant is an aviator, the other two officers have an infantry and logistics background, covering each component of the MAGTF. Most recently, Paxton and Lt. Gen. Willie Williams, a logistics officer, have served as Amos’ top advisers. — If Paxton is selected to become the commandant, it’s highly likely the new assistant commandant would be an aviator. Currently, the top one after Amos is Lt. Gen. Robert Schmidle, the deputy commandant for aviation, whose name came up several times during speculation about who would replace Dunford as assistant commandant. — To maintain the “mini-MAGTF” concept at the top, it wouldn’t be possible to name infantry officers like Gen. John Kelly, head of U.S. Southern Command, or Lt. Gen. Thomas Waldhauser, the senior military adviser to the secretary of defense, as the next commandant without having an aviator as assistant commandant. That effectively removes Paxton, just a few months after the respected general took over as the Corps’ No. 2 officer. That makes no sense. Given all these points, the odds seem slim that Amos would be selected to serve in Europe. It is noteworthy that retired Gen. James Jones, the 32nd commandant, made that same move in January 2003, but that doesn’t mean it’ll occur again now. Then again, a lot of folks were shocked when decades of precedent were broken when an aviator became commandant. It’ll be interesting to see what happens in coming days. Correction: Gen. Dunford did not “step down” to assume role as ISAF. ACMC post is a two year term under Title 10 of the United States Code. He may have been reappointed, but his term was about to expire. Cpl. Roy, Gen. Dunford had been serving as ACMC since October 2010. That’s longer than two years. Appointing Gen. Williams opens the door for an aviator to take over staff, and Gen. Williams would provide the most continuity of command, having worked so closely with Amos and Dunford. It would mean a logistician as CMC, which means a complete freak out by the Old Corps. Correct Sir, ACMC by a matter of a few week longer, his post for months prior to assumption of reins at ISAF was that of Special Assistant to the Chairman JCS–little shell game to keep all the players eligible.